I have purchased and have read every single book that is reviewed below. And it is my goal to review every single one as honestly as I possibly can. In other words, I don't want you to own a book that I would not proudly want to put on my own book shelf at home. (Now, I know what you might be thinking... "What happens to the books that you review that don't get put on your bookshelf at home". So with that, I have decided to break this up into two main sections. One is for books that I think are more appropriate for beginners and the other is for the more experienced at home sushi chefs. In this section we will present and review books that, after reading them, are what I would consider appropriate for the beginning at home sushi chef. That doesn't mean that the book would not benefit more experienced sushi connoisseurs so much as the content would not be too advanced for the beginner. 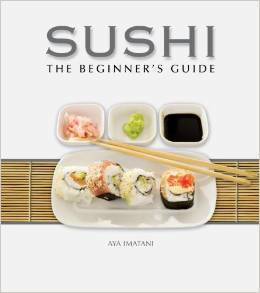 This is a very popular beginner sushi book and is a very good seller on Amazon. It is a paperback with only a couple of color pictures included (in the middle) and teaches mainly through the use of illustrations and content. 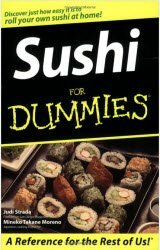 To see our review of this book visit our Sushi for Dummies review page, or if you want to buy it you can get it on Amazon here. 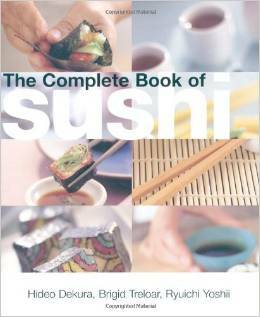 This is also a very popular beginner sushi book and is a very good seller on Amazon. This one is a hardback and unlike the dummies book above, contains tons of pictures that are used to accompany many step by step instructions. To see our review of this book visit our Sushi The Beginner's Guide review page, or if you want to buy it you can get it on Amazon here. 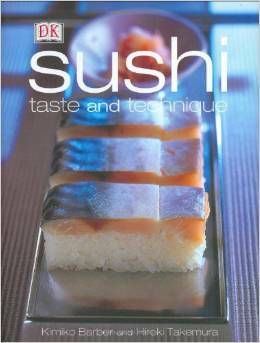 This is the only 5 star sushi book listed on Amazon at this time so I had to review it. And I have disagreed with Amazon reviewers before too, so that's not a stretch. Especially on sushi making kits. But this is a book and 5 stars is pretty high praise. Did I agree with Amazon reviewers this time? Come find out... visit our Sushi taste and technique review page, or if you want to buy it you can get it on Amazon here. Have You Read a Sushi Book You'd Like to Review? If you've read a sushi book recently, tell us about it!